NEW YORK (CNN) -- The son of a New York City assistant principal who died after being hospitalized with the H1N1 flu virus is a baseball hero. Jordan Wiener said of his father, "He would want me do what I do best and that's pitching." Jordan Wiener, 18, of Robert F. Kennedy High School pitched a no-hitter on Thursday, leading his high school team to a 10-0 victory the day after his father's funeral. 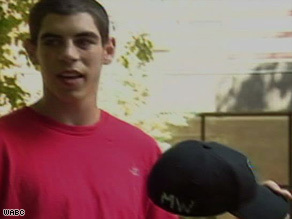 He pitched the entire game wearing a cap with his father's initials -- M.W., for Mitchell Wiener -- on it. "He would want me do what I do best and that's pitching," Wiener said in an interview. "I think he's smiling down on me right now." The advanced-placement student struck out 14 batters to beat Brooklyn's Prospect Heights High School in five innings. "It was an amazing and a very emotional game to watch," Ira Pernick, the principal of the school told CNN. " I was concerned about his emotional well-being, but he was dominant, absolutely dominant and incredibly brave." Mitchell Wiener, a middle school assistant principal, died last Sunday after contracting the H1N1 virus. City health officials said Wiener also had an underlying condition.